Dear Applicants, if you are searching Rajasthan Police Bharti Notification 2018 for 623 Constable Vacancy. Then here is good news for you. Police Department of Rajasthan has issued notification for filling up 623 Constable Vacancy. Raj Police Constable Notification is released for only Rajasthan State Tribal sub-plan area candidate. So, applicants, those are interested and eligible may apply through online mode. Participants can fill their application form from 21.07.2018. The last date of registration for राजस्थान पुलिस भर्ती 2018 is 10.08.2018. Rest of details read our full article carefully. 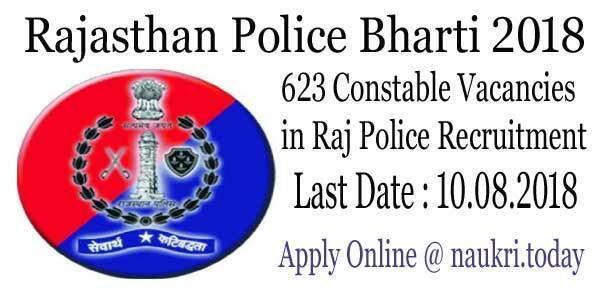 Rajasthan Police is inviting online application for 623 Constable Vacancies. The Raj Police Recruitment Notification 2018 is released for MBC Banswara Constable Posts. Applicants those are belonging to Rajasthan State Tribal Area Sub Plan are eligible for Constable posts. This is a golden opportunity for those candidates. Now you can fill Rajasthan Police Constable Vacancy online form on 21.07.2018 to 10.08.2018. Furthermore, information of Raj Police Jobs 2018 like eligibility criteria, application fees, selection procedure mention below. Check full page to apply online direct for Rajasthan Police Constable Recruitment 2018. Fresh Update as on 21.07.2018 : Rajasthan Police Bharti for 623 Constable Vacancy online application form is available from today i.e. 21.07.2018. Applicants who want to apply for Rajasthan Police Constable Jobs may fill their application form till 10.08.2018. The direct link to apply online is available at the end of article. So don;t wait last minute rush and apply online for 623 Constable Vacancy. Application Fees For Rajasthan Police Recruitment 2018 – How To Pay Raj Police Constable Bharti Fees? What is the Important Dates For Rajasthan Police Recruitment 2018 ? 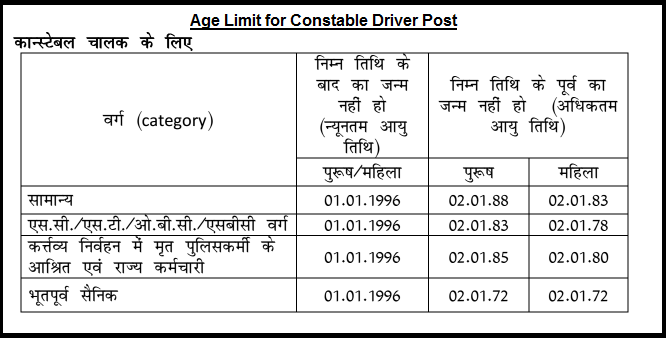 What is the Age Limit & Relaxation for Rajasthan Police Bharti 2018 Constable Jobs ? How To Check Rajasthan Police Constable Bharti परीक्षा शुल्क, वेतनमान & चयन प्रक्रिया ? How Much Monthly Salary will paid for Rajasthan Police Vacancy 2018 ? What are the Eligibility Criteria for Rajasthan Police Bharti 2017 for 12,696 Constable Jobs ? Only applicants those are belonging to tribal plan area Rajasthan is eligible for Rajasthan Police Vacancy 2018. Other eligibility details like education qualification, age limit and other you can check from below section. Applicants minimum education is required passed in class 8th from recognized board. For Rajasthan Police Bharti 2018 applicants also have knowledge for devnagri lipi and Rajasthan culture. If you are going to apply for Constable Driver post then you must have LMV/HMV Driving license. For more details check Rajasthan Police Recruitment Notification 2018. Age criteria will be decided as on 01.01.2019. Candidates minimum age is required 18 years for Raj Police Vacancy 2018. Participants should not be more than 25 years for General and band Constable post. Rajasthan Police Jobs for Driver Constable post the upper age is required 26 years. 04-year relaxation is applicable for all applicants. for more details check below section. If you are going to fill Rajasthan Police Bharti online form then you also require to pay application fees. 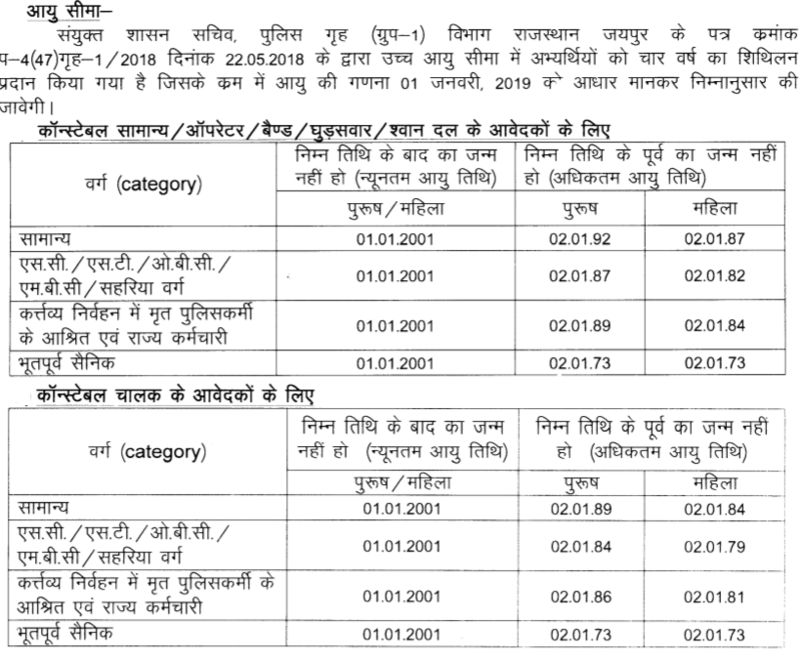 Only Rajasthan State TSP Area candidates apply for Raj Police Recruitment 2018. General Candidates have to pay Rs. 400/- while SC/ST candidates need to pay Rs. 350/-. Applicants whose family income is less than 2.5 lac are required to pay Rs. 350/- towards Rajasthan Police Constable Bharti Fees. Fees will be pay through e-mitra center. For more details check Raj Police Jobs Notification, mention at the end of article. Candidates will receive Rs. 14600/- during the probation period. The duration of probation period for Rajasthan Police Bharti is 02 years. Afterward applicants will receive a salary as per pay commission of 07th. For Rajasthan Police Constable Recruitment Pay band is decided Pay level- 5. Applicants selection will be made according to written examination, physical test and personal interview. First, all applicants for Rajasthan Police Constable Bharti called for written examination. Qualify candidates can attend the next round. Details of Physical Standards and Medical Examination is given below. In this section, we provide information regarding candidate height, chest size and weight. Read given below physical standard of Rajasthan Police Bharti 2018 for 623 Constable Posts. Applicants who are interested and eligible for Raj Police Bharti 2018 can apply online here. Before fill, online application form candidates must require valid email id and mobile no. Participants also have scan photograph and signature to apply for Rajasthan Police Vacancy 2018. First of all, candidates go to official site police.rajasthan.gov.in. Download official Rajasthan Police Constable Bharti advertisement. If you are eligible go to apply online on sso.rajasthan.gov.in. Candidates those are already registered in SSO portal can directly fill Raj Police Vacancy form. If you don’t register yet on sso portal, fill personal information and get SSO id and password. Now go to apply online for Rajasthan Police Bharti 2018 for 623 Constable Vacancy. Enter all required information regarding your qualification & other. Upload signature and photograph and make payment of application fees. Now submit Raj Police Constable Jobs online form. Take print out of Rajasthan Police Recruitment Online Form. You can also apply directly through below link. Conclusion : Rajasthan Police Bharti for 623 Constable Vacancy in TSP Area. 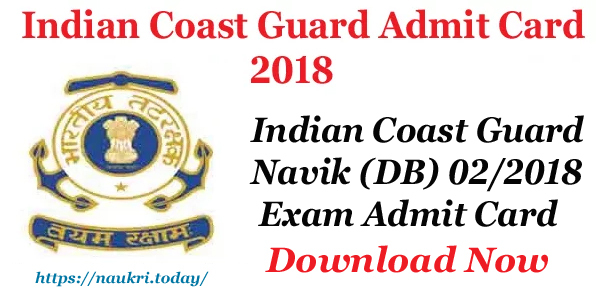 Interested and eligible candidates may fill online form from 21.07.2018 to 10.08.2018. The examination will be going to held on September 2018. Applicants, Are you Looking for Rajasthan Police Bharti News ???? If yes then here is very important related to राजस्थान पुलिस भर्ती 2018. Police Department, Rajasthan has recently published advertisement for recruiting candidates on 13142 Constable Vacancy in place of 5390 Constable vacancy. Submission of online form for Rajasthan Police Vacancy has been started from 25.05.2018. Candidates who are interested in Raj Police Constable Recruitment 2018 should check Eligibility Criteria, Pay Scale & other Details which is mention in the below article. Rajasthan Police Department is inviting online application for filling up 13142 Constable Vacancies. Candidates who are waiting for Raj Police Constable Vacancy Notification this is a great opportunity for them. Appliers can fill online form till the last date from here. To get more information related to Rajasthan Police Recruitment 2018 then read the article properly, all information is available Here. Fresh News as on 30.05.2018 : Rajasthan Police Recruitment 2018 online form already available here. Applicants who want to apply for Raj Police Constable Jobs may apply here through online mode till last date 14.06.2018. The online link is available at the end of article. Police Dept, Rajasthan has issued Notification of 13142 Constable Vacancies. 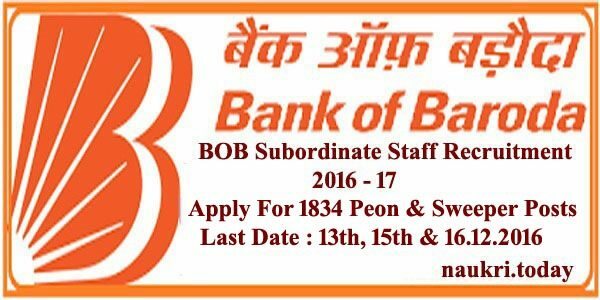 District Wise & TST Non TSP Area Vacancies Division is available here & Also given in official notification. After Publication of Notification, our team is providing Division of Raj Police Vacancy in this article. Date for depositing application fee : 14.06.2018. All the Participant who are going to filling Raj Police Constable Recruitment 2018 should check Education Qualification & Age Criteria, which is required to fill online form. We are providing full information about Eligibility Criteria for Rajasthan Police Vacancy 2018. Contender must have passed 10th Class (Matriculation)/ 12th or higher qualification from any recognized Board for Raj Police Bharti 2018. Candidates who are applying for Constable (Driver & Operatives) Vacancy should have knowledge of in respective trade & relevant Experience. upper age 42 years for ESM category appliers. After qualifiy the written examination applicants also fulfill physical standards of Rajasthan Police Constable Vacancy 2018. Details are mention below. Candidates, In the below section you can get full information about Fees, Pay Grade & Selection Method for Rajasthan Police Bharti 2018. All the information which is mentioned below you can also check from official Raj Police Constable Notification, which is mention here. All the candidates of General/OBC Category must paid Rs. 400/- as application fee for Raj Police Recruitment 2018. Other category applicants of SC/ST need to pay an application fee for Rs. 350/- for filling up online form for Rajasthan Police Constable Vacancy 2018. Fees must be deposit through E Mitra Kiosk. New Candidates who are going to apply for Rajasthan Police Constable Jobs will also pay Rs. 26/- with application fees. Old applicants are required to pay Rs. 20/- only and not require to pay application fees. 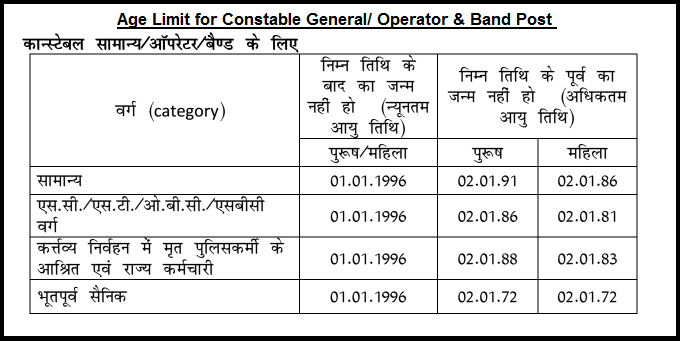 Applicants who will get selected for Raj Police Bharti 2018 will paid pay band Rs. 14600/- during the probation period of 02 years. Then after according to 07th Pay commission the pay scale will be made on the basis of pay matrix level -5. Furthermore, details check official notification of Raj Police Recruitment 2018, which is mention below. 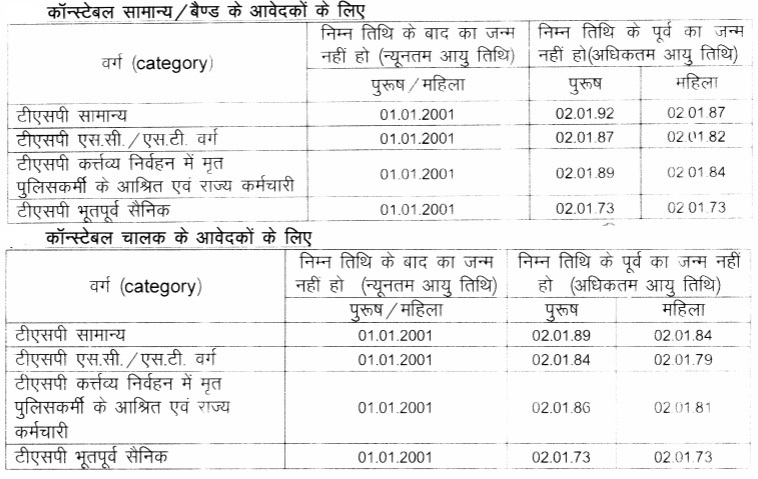 Candidates will selected for Raj Police Recruitment on the basis of Department Exam Scheme, which is shown below. Full information related to Exam Pattern & Procedure of Examination is shown in advertisement of Rajasthan Police Jobs, which is available Here in below article. Firstly candidates log on to the official website www.police.rajasthan.gov.in. Read full notification of Rajasthan Police Recruitment carefully. Then log on to sso portal sso.rajasthan.gov.in. Now click on Recruitment Section & Click on Official Recruitment of Rajasthan Police Constable Vacancy Notification. Read all the information mention in notification carefully. Recheck all filled details in form before submit Raj Police Online form. Take print out of Rajasthan Police Jobs Form for future use. Conclusion : – Rajasthan Police Bharti 2018 For 13142 Constable Vacancies. Candidates can fill online form for Rajasthan Police 13142 Constables Vacancies on or before the closing date. Candidates keep in touch with this page for more updates. Here is great news for those candidate who are waiting for Rajasthan Police Bharti Notification 2017. Now the Police Department, Rajasthan has announced latest recruitment notification of 12,696 Rajasthan Police Constable Bharti. So therefore those candidate who are eligible and interested for Constable General, Constable Driver & Constable Operator Vacancy can fill up the application form for Rajasthan Police Vacancy 2017. The Application form will available from 22.08.2017. So interested candidate can fill up the application form on or before the last date 22.09.2017. Raj Police Department has published notification for Rajasthan Police Bharti 2017. This is a good opportunity for candidate who are looking Police Constable Jobs in Raj Police Department. Candidate who have passed 10th Standard from a recognized Board are eligible for Raj Police Constable Jobs. So therefore those candidate who are eligible and interested for Government Police Jobs can fill the up the Rajasthan Police Constable Application Form till the last date 29.09.2017. To know about details regarding Education Qualification, Age Limit, Application Fee and Selection Process you can check notification of Rajasthan Police Constable Bharti 2017. Notification link is available below. Name of Raj Police Jobs : Constable General, Constable Driver & Constable Operator etc. All the Job Seeker who are going to fill online form for Rajasthan Police Recruitment 2017 should check required Qualification, Age & Other Details for Constable Vacancy from here, By reading the below section you can get full information about Raj Police Constable Bharti 2017 – 18. To Apply for Rajasthan Police Constable Recruitment, Candidate should have passed Xth Standard from a recognized Board. Those candidate who are willing to apply for Rajasthan Police Constable Operator vacancy, should have passed Higher Secondary Examination with Science subject. General & OBC Category : Candidate should have pay application fee of Rs. 200/-. SC/ ST Candidate of Rajasthan State : Applicants should have pay application fee of Rs. 150/-. Candidate who will select for Rajasthan Police Constable Jobs, will receive the salary of Rs. 5,200/- to Rs. 20,200/- with Grade pay of Rs. 2,400/- and other allowance will be admissible as per rule of Raj Police Department. Rajasthan Police Department will held the written examination for selection of Rajasthan Police Constable Post. This examination will consist a paper of 75 marks. It will comprising three parts i.e Part-A, Part-B and Part-C of Logical Reasoning & General Ability, General Science and General Knowledge subject. Part-A : In this section, 01 marks will be awarded for each right answer and negative marking of 1/4 marks for each wrong answer. Part-B & C : In this section, 1/2 marks will be awarded for each right answer and negative marking of 1/8 marks for each wrong answer. 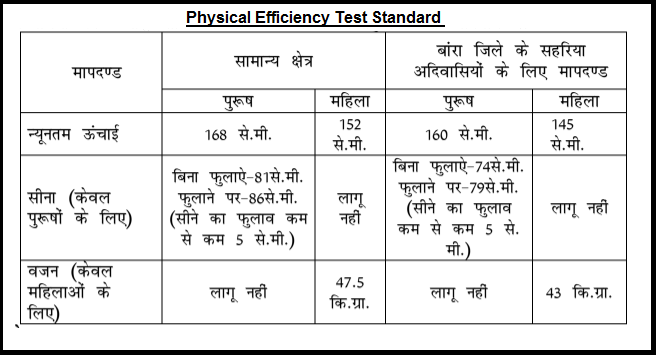 Rajasthan Police Department will held the Efficiency Test for Constable Driver/ Band post. This test will held for those candidate who are shortlist in Rajasthan Police Constable Driver/ Band Physical Efficiency Test. This test will consist a total of 15 marks. Those candidate who shortlist in Physical Efficiency Test, will be called for Document Verification Test . In this test, candidate’s will awarded the marks on the basis of Certification in NCC, Homegard, Computer Knowledge & Technical Qualification from Polytechnic/ ITI. Those candidate who shortlist on Document Verification Test will be called for Medical Test. Applicants can check full information about Medical Examination which is mention in Raj Police Jobs Notification. After the Medical Examination, candidate should have undergo for Certificate & Character Verification Test. Then you should click on notification of “Rajasthan Police Bharti 2017 Notification”. Take the print out of Raj Police Jobs application for future use. Conclusion : Raj Police Department has issued notification for 12,696 Rajasthan Police Constable Bharti 2017. Those candidate who are eligible and interested for Constable General, Constable Driver & Constable Operator Vacancy can fill up the application for Raj Police Bharti 2017. Date for submission of Constable Online Form is 22.09.2017.